To have a constant access to the Internet, we use smartphones, so the mobile phone usage tends to overtop the desktop usage enormously. That’s the reason for us who want to have a modern website why we should think about the mobile experience for our website audience. To be more effective and user-friendly, our website has to match several standards. The best bet is to own a website that can display properly and beautifully on every device screen. You should also consider the load time of your website, because people are mostly impatient and they better click away rather than wait until your website’s loaded. Paying attention to two important factors above, Google developers have come up with Google AMP. AMP or Accelerated Mobile Pages is a project supported by Google development team in order for people like us to have web pages that load quite instantly and deliver an excellent mobile user experience. But the problem is if you want to create an AMP-based page, you need to know AMP HTML, AMP JS and have some coding skills. But what if we don’t want to waste our time learning about coding? There are some automatic applications for those who are too busy or lazy to create AMP sites manually. One of these is Mobirise AMP Page Builder. Mobirise doesn’t only allow you to build your AMP pages with no coding at all but also gives an opportunity to use ready-made templates. By this time there are 4 full-fledged AMP themes that contain common website sections or blocks from menus, footers and contact forms to galleries, sliders and combined blocks with texts, cards, images and videos. All these templates are already optimized for mobile devices automatically and you don’t need to do anything to accomplish it. Since AMP pages are a little limited in comparison to the standard HTML pages, there are some restrictions in design features available in these templates. 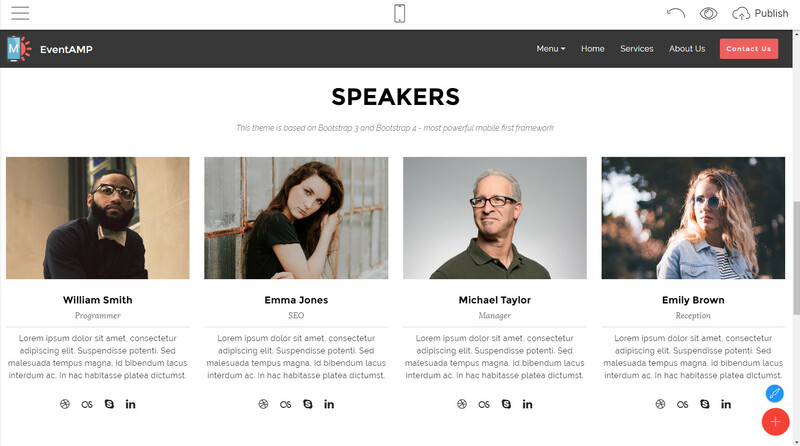 One bootstrap template from other templates that incorporate AMP’s simplicity, Bootstrap’s mobile-friendliness and current web trends is EventAMP. 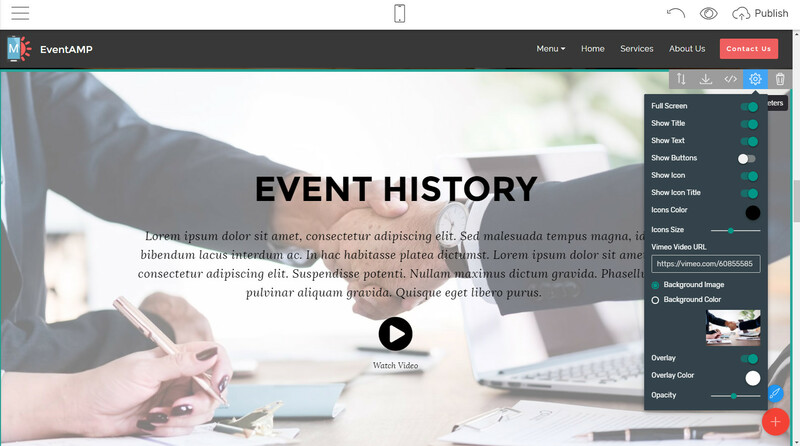 As the theme title says, this event website template is a perfect fit for those who want to create a page for events. But basically, you can build many types of sites on any topic with it. This kind of pages is recommended to be used as blog posts, news, announces, press-releases, because they actually can possibly appear in Google carousel results. 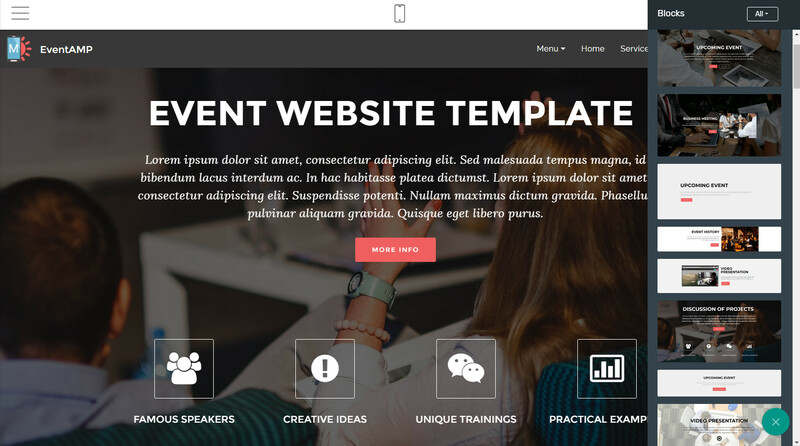 The EventAMP event website template offers a lot of outstanding features the most AMP pages doesn’t have. 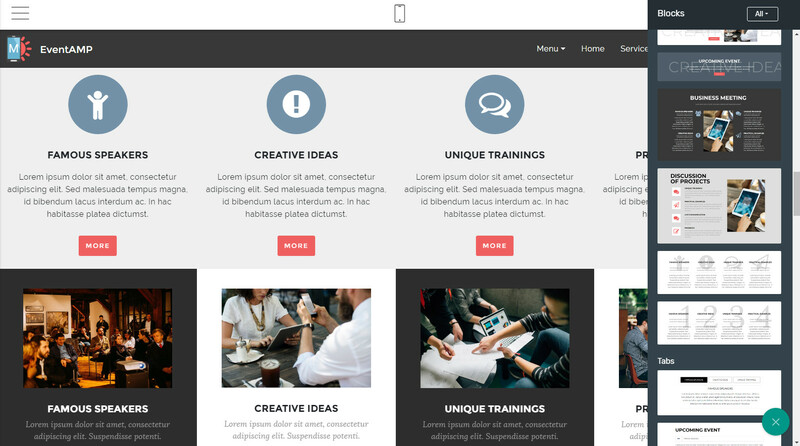 These are semi-transparent color overlays, button animations, menu sidebars, image and video embeds, various text styles, icons and much more. Moreover, EventAMP contains by and large more than 65 site blocks and that makes it possible for you to create completely unique layouts. Actually, you need no guide to be able to set up valid AMP sites with Mobirise. Even children can build their sites with it. But it’s up to you to make it look professional. To get started, you need to open the Mobirise application, choose the EventAMP and drag blocks one by one directly on your blank page. You are free to reorder them and then change their appearance starting with text styles, backgrounds, colors and ending up with images and videos on the page. I don’t seem to find many disadvantages in using the EventAMP event website template. If we sort through the web results about it, the most common problems faced while using AMP pages are that it’s hard to implement. But this doesn’t make a point if you are using the event website template. It’s way easier to talk about cons of using AMP technologies. As said earlier, AMP websites are very convenient to view on smartphones. Your visitors don’t need to wait that long to see all of your content on the page. This can obviously lead to more page visits. Your website audience gets the information they were looking for quickly, so they are satisfied. The AMP Bootstrap 4 template with Mobirise is here an excellent tool to achieve it. 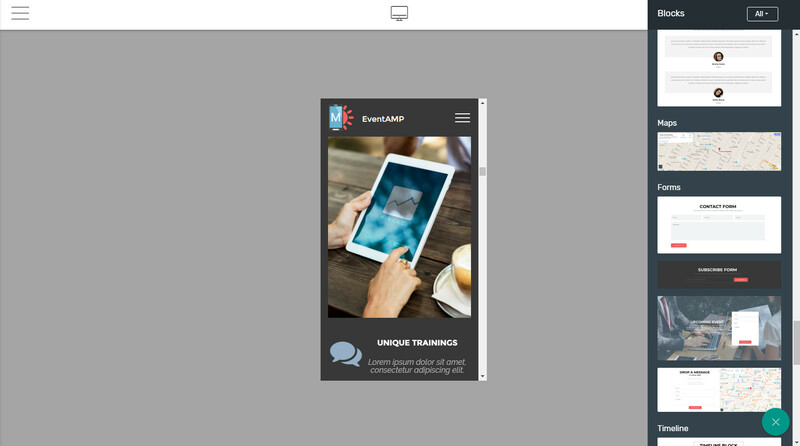 I wouldn’t miss the opportunity to build a mobile-ready, Google-friendly and lightning-fast website and this offers Google AMP and Mobirise with its AMP templates like EventAMP.